DCU footballers believe they have learned from their past failures to be able to overcome UCD in the Sigerson cup quarter final. Following the recent years of quarter-final heartbreaks during the realm of legendary manager Niall Moyna, newly appointed boss Paddy Christie now believes this could be their time to topple the Sigerson Cup champions across the Liffey in Belfield this evening. Fresher’s football in DCU has been striving in the past number of years, winning three All-Irelands in a row. However, the same success has failed to rub off on the DCU Sigerson team, but with the introduction of new faces from the winning fresher teams like Kieran Dwyer, David Garland and Luke Towey, there now seems to be a gathering of a team with enough experience and success to finally seek a semi-final spot. “Almost every player on this team has an All-Ireland Freshers medal, so it’s about combining that previous success with the team we have now. “We have players representing fifteen counties, we don’t focus on opposition and we don’t have any egos, so if we get our focus right and learn from our past mistakes there is definitely a Sigerson title in this team,” Luke Towey from Sligo told The College View. 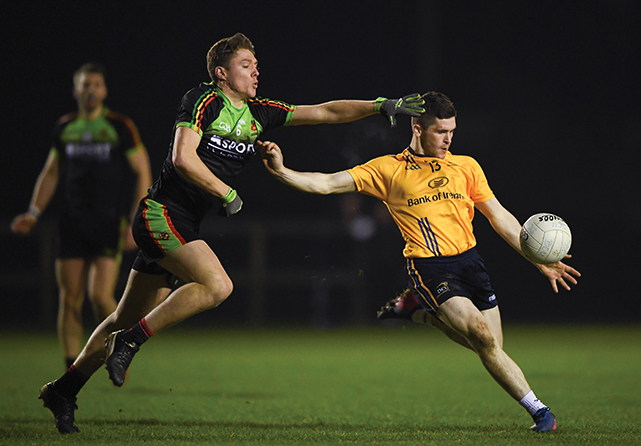 DCU have already faced disappointment this season losing out in the league final by one point, as well as suffering a second half scare from IT Carlow in the previous round of the Sigerson three weeks ago. DCU were 11 points clear at half-time following Brian Reape’s first minute goal before IT Carlow’s Diarmuid Whelan inspired a fightback from the visitors, with the game finishing on a 1-16 to 0-14 scoreline in DCU’s favour. “We simply didn’t reach the intensity we could have. Against Carlow in the first half we made sixty tackles, in the second half we only made twenty, we are going to make sure that doesn’t happen the next game and we consistently keep our performance high,” said Towey. On top of the buzz surrounding the DCU footballers, the DCU Hurlers will be aiming to reach another Fitzgibbon final this year following their first ever Fitzgibbon Cup final appearance last year. A compelling eleven-point win over Cork IT and a two-point win over Waterford IT, places the DCU hurlers into the quarter finals where they will face DIT tomorrow, Thursday 7th. Manager Eoin Roche will feel an air confidence as DCU are facing this Fitzgibbon Cup campaign as league champions for the first time in their history, after beating UCC by 3 points a little over two months ago. Patrick Curran, Paudie Foley, Donal Burke and the rest of the squad will be putting their heads down in the next coming days focusing on a goal that once seemed impossible in DCU GAA.